Paolo Rossi’s professional career lasted just 13 years as he retired from football in 1987 at the somewhat early age of 31. And while Rossi doesn’t even come near the top 10 most capped Italian internationals, his performance during the 1982 Fifa World Cup in Spain made him an instant legend and a “no-doubt” pick for our World Cup Heroes series. While Rossi’s club football success is most notable during his days with Juventus, his first call-up to the Italian squad came in 1977 when he was playing for domestic side Lanerossi Vicenza (currently just called Vicenza). A year later at the age of 21 Rossi was named to the Italian squad that would fly across the Atlantic, to compete in the 1978 Fifa World Cup in Argentina. Drawn in a group with Hungary, France and hosts Argentina, the Italian squad with Rossi up-front managed to avoid any damage, winning all 3 matches. Paolo Rossi scored a goal in each of the first two matches, but although he could not manage a goal against the hosts, the Italians came out victorious with a 1-0 win, Argentina managed to avoid embarrassment with a second place finish. In the next round (again played in a group format, with the winners of the two groups advancing straight to the Finals) Rossi did not manage to shine, and although his goal was the one that provided Italy with a 1-0 victory, Italy could not manage to claim first place in their group, qualifying to the 3rd place match up against Brazil and losing that as well, with Rossi in the line-up, but unable to put a ball past Brazilian keeper Leão. In 1980, Paolo Rossi along with 19 other footballers and 2 team managers was involved in the Totonero gambling scandal. He was suspended from football for 2 year (reduced from an original 3 year sentence) and therefore had to miss out on the 1980 Euros that coincidentally took place in Italy, with the host nation of course being favorites to win the title on home soil. But without Rossi and partner striker Bruno Giordano (who was also involved in the Totonero), Italy managed to produce very little offense, scoring just twice in four matches and watched West Germany raise the trophy in Rome. The 1982 World Cup in Spain was Paolo Rossi’s stamp on the world of football. But to understand the intricate details of what went on, let’s briefly talk about up the format changes that the 1982 tournament took on. THE FORMAT: In the first round robin the 24 participating nations were divided into 6 groups of 4 teams. The two group winners would then go-on to the next round, in which the 12 squads were put into 4 groups of 3 teams. And lastly, the winners of the 4 groups would advance to the semi-finals (hopefully you can understand how it worked from there without having to purchase Soccer for Dummies). In the first group stage, Italy were drawn in with Poland, Cameroon and Peru. But while it seemed like a fairly easy draw for the Azzurri, Rossi (who now played for Italian giants Juventus) could not find his feet and could not find the net in all of his nation’s three matches. Italy managed to scrape by and qualify to the next round over third place (and first time World Cup participant) Cameroon by a virtue of having scored more goals, a total of 2 in 3 matches. 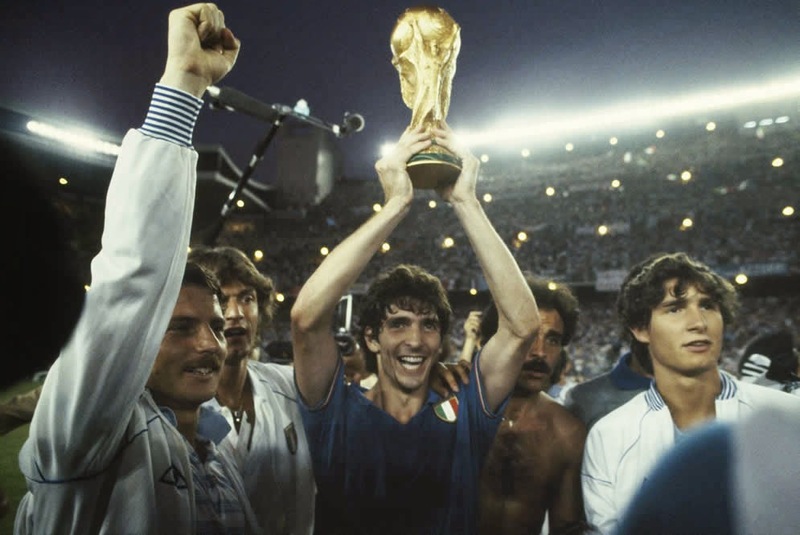 From that moment on it would be Paolo Rossi, who would almost single-handedly provide the Italians with their third World Cup title. Drawn with world football giants Argentina and Brazil in the second round of play, few gave the Italians a chance of qualifying to the semis, after their dismal performances in the previous stage. But, with the Italians claiming a 2-1 victory over the Argentines and Brazil doing so as well with a score of 3-1, the match-up that would put Rossi on the world stage was set, with Italy and Brazil having to play it out for a spot in the semi-finals. Brazil held a one goal advantage in the differential, and so a loss or a draw would show the exit door to the Italians. Rossi was not in a mood to wait long, and headed a good ball from teammate Cabrini past Brazilian keeper Waldir Peres in just the 5th minute to give Italy the advantage. But a Brazilian squad filled with talented footballers the likes of Socrates, Zico and Falcao, seemed to have all the answers, and just 7 minutes later, fooling Italian keeper Dino Zoff with a shot to the near post, Socrates tied the game up at 1-1. In the 25th minute of the match Rossi injected life into the Italian squad yet again, pouncing on a defensive mistake made by the Brazilians and scoring his second of the match with a powerful strike from just outside the box. In the second half, with the Italians still ahead 2-1, Rossi had an incredible chance inside the Brazilian box to put a third goal in and surely place his team in the semis, but saw his shot go wide of the post. The Brazilians pressed on and although keeper Zoff made sure the ball stayed out of his net on multiple occasions, in the 68th minute the Italian defense froze with the ball at Brazilian midfielder Falcao’s feet; Falcao’s strike left Zoff helpless and with just over 20 minutes to play Brazil was on course to a semi-final qualification. 6 minutes later, a corner-kick for the Italians would prove to be the decisive moment of the match, and a moment Paolo Rossi would cherish for the rest of his life. A harmless looking ball to the edge of the Brazilian box found a couple of players before conveniently landing at Rossi’s feet, and with the easiest half-volley he would ever attempt, Rossi had his hat-trick and a place in the World Cup semi-finals. In the semis the Italians would meet Poland for the second time in this tournament. After a 0-0 draw in their previous encounter less than a month earlier in front of 33,000 spectators in Vigo, the stage was set for Rossi to shine on a bigger stage at the Camp Nou in Barcelona. Rossi did not disappoint, again scoring all of Italy’s goals in a 2-0 victory that would seal a finals match-up with the West Germans who raised the European championship trophy just two years earlier on Italian ground. In the finals, in front of an audience of 90,000 at the Estadio Santiago Bernabéu in Madrid, both the Italians and Germans failed to find a goal in the first half (Italy missed a penalty in the first half). But in the second half, the already “back and forth” match opened up even more and the goals started to flow, with Rossi opening the scoring in the 57th minute by way of a low headed ball inside the German box. Rossi would not score another goal in the match, but his teammates found a way to secure a glorious 3-1 victory, and claim the World Cup title. At the conclusion of the tournament, Rossi received the Golden Boot award for most goals in the tournament with a tally of 6. He was also crowned the best player in the tournament with the first ever Golden Ball award. Leading up to the European Championships in France 1984, The Italian national team struggled in the qualifying matches and with just 1 goal from Paolo Rossi (in the very final match of qualifying against Cyprus) Italy failed to qualify to the tournament they hosted just 4 years earlier. In 1986, Rossi was selected to represent his country and defend the World Cup title in Mexico. 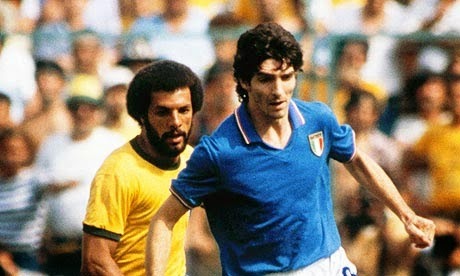 However, due to injury Rossi did not play in the tournament; marking the 1982 Fifa World Cup not only as the most memorable and important tournament in Rossi’s career, but also as the last major tournament he would ever play in, retiring from professional football one year later in 1987. In 2004, Brazilian legend Pelé released a list of 125 “Greatest Living Footballers” to commemorate FIFA’s 100 year anniversary. 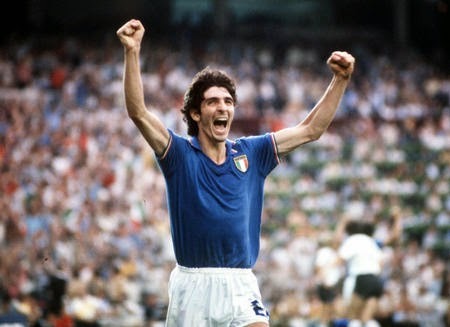 Paolo Rossi along with 13 other Italian internationals were named on that list.